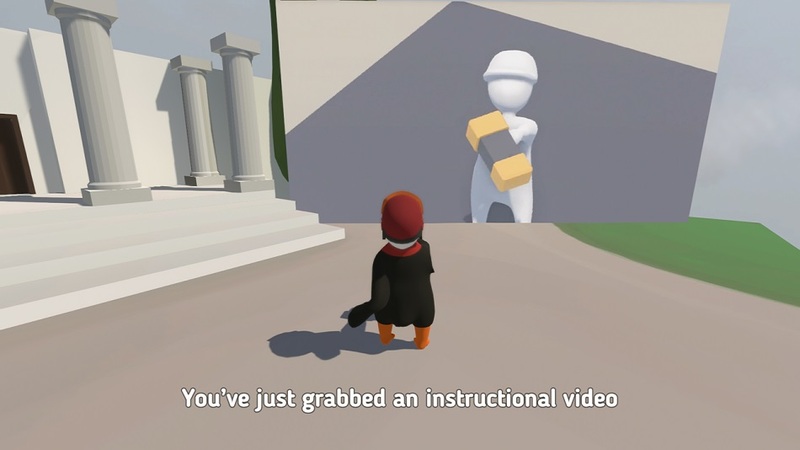 I’ve been playing Human Fall Flat for a couple of years now, and have loved it. I originally bought it because it offered split-screen multiplayer, and beat the campaign with my husband. I’ve never seen either of us get so mad or laugh so hard. 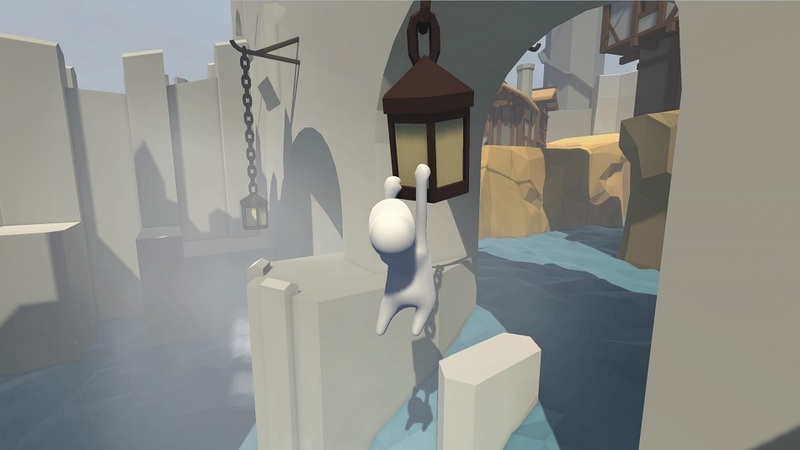 In Human Fall Flat, the player is a ragdoll, sort of marshmallow-looking guy who tries to solve discrete areas that are each essentially one big puzzle. The ultimate goal of each is to jump through an exit door on the edge of the map and land on the next one below. It sounds simple but the catch is in the control scheme — the left stick handles movement and and the right handles the camera, as usual, but the character’s arms are the challenge. While looking around, the character will bend or turn in that direction, and the player uses the left and right triggers to control the left and right arms respectively. Holding the trigger “grabs” with that arm, so doing a simple puzzle like plugging wires into a socket requires the coordinated effort of bending down, grabbing the wires, and trying to move the little ragdoll arms in just the right direction. Climbing is about sticking the character’s arms up in the air and running at cliff sides, hoping to grab on. As one might expect, physics factor heavily into every aspect of the experience, so even things that look easy require a good deal of finesse. The entire campaign can be finished in singleplayer, but as someone who beat it the first time in co-op, the thought of going solo seems incredibly difficult. 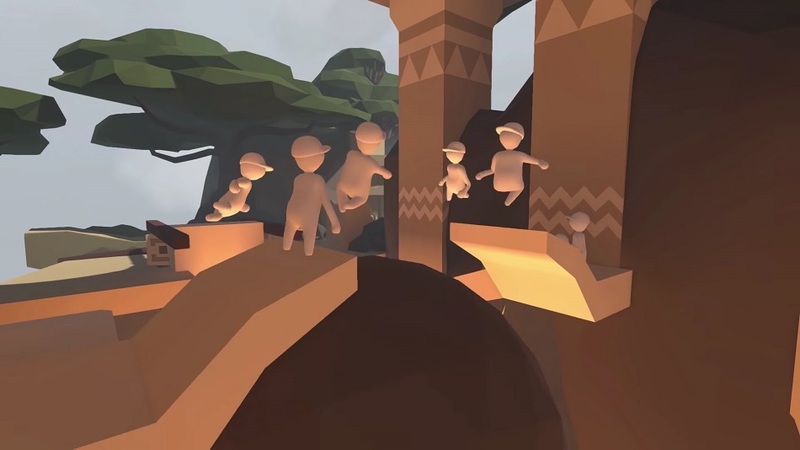 This is why I was so excited when Human Fall Flat announced an online multiplayer option in addition to the couch co-op. I’m pretty sure I can’t convince my husband to play it with me again, but I thought it would be interesting to play with other people since local offers the opportunity to talk with and strategize, whereas online multiplayer offers no such thing. I was giggling from the very start when I went online and there were eight of us in a map. One or two of us were always trying to explore, someone was just trying to get the puzzle done, and a couple others were trying to grab onto someone and throw them off the edge — like a Cosmo quiz or a “which one are YOU?” online article, it’s a good indicator of someone’s personality. There were frustrating times where people would repeatedly throw a box off the edge even though we needed it to weigh down a door switch, or they’d grab a rope and swing across a ravine without waiting for anybody else. However, it seems impossible to actually stop anybody from completing a level, even if they’re trying to. 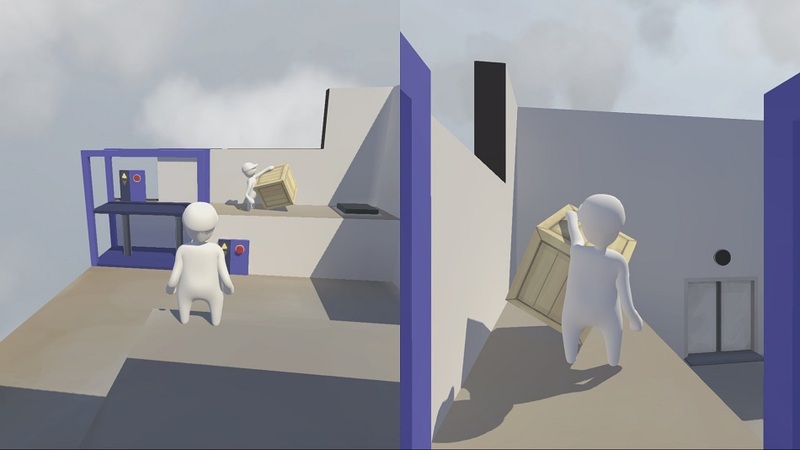 Any item lost or destroyed respawns almost instantly, and there are always multiple ways around (or across) whatever obstacle is being tackled. Character customization makes it easy to tell everyone apart. I am currently dressed up as a penguin, and I met a couple of bearded hipsters, a dinosaur, and a fireman. Costumes can be recolored and can be worn as a whole or in pieces, and even the basic ‘naked’ character made of round head, limbs, and a body can be recolored. Players can drop in and out with no issue and I often started a level with a totally different group than I finished with. Unfortunately, the online multi screens aren’t particularly user-friendly — they’re really just a list of hosts. There’s no information about whether someone is playing friends-only or public, and I often got errors saying I couldn’t connect because they were playing a private game. That said, I had great luck hosting games myself, and it seems like there are plenty of people playing. Disclosures: This game is developed by No Brakes Games and published by Curve Digital. It is currently available on PlayStation 4, Nintendo Switch, Xbox One, PC, Mac, Linux. This copy of the game was obtained via paid download and reviewed on the Xbox One. Approximately 10 hours of play were devoted to the single-player mode, and the game was completed. 30 hours of play were spent in multiplayer modes between split-screen and online multiplayer. Parents: According to the ESRB, this game is rated E. There are no content descriptors. This game feels really safe for kids — it’s a bit like playing with dolls. Have no fear with this one. Nothing objectionable here. Deaf & Hard of Hearing Gamers: In-game speech is minimal and subtitled at the bottom of the screen. There are no visual cues to indicate sounds of other players moving around but I didn’t notice any problems playing without sound. Subtitles cannot be changed for font size or anything else. 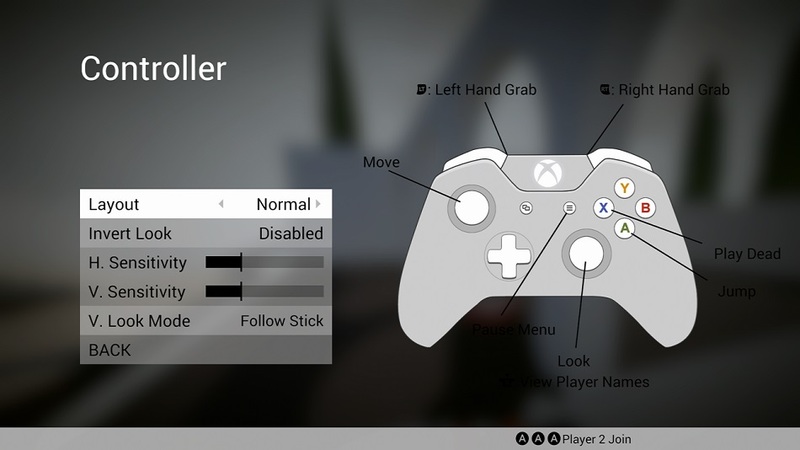 Remappable Controls: Certain functions are remappable — there is a ‘southpaw’ option to switch the right and left sticks. Rebekah's introduction to videogames came when she was 6 and got a Gamecube with Super Mario Sunshine for Christmas. Since then, she's been effectively preferring NPCs to real humans and procrastinating by moonlighting as a Witcher, assassin, wizard, conduit, and more. Rebekah first found GameCritics doing a research paper about accessibility in videogames, and was intrigued by the standards found on the site. Seeing an opportunity to combine a love of games with a love of writing, Rebekah reached out and has been writing for GC since then.